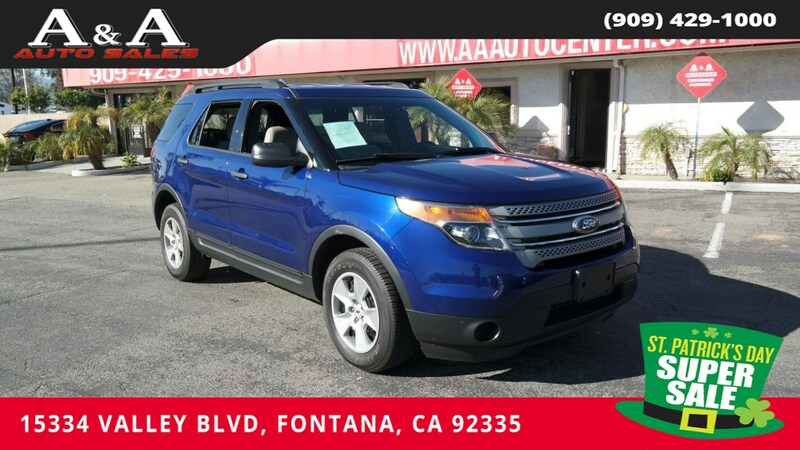 Meet our spectacular and able-bodied 2013 Ford Explorer XLT 4WD shown in Deep Impact Blue. Powered by a 3.5 Liter V6 that offers 290hp while connected to a smooth shifting 6 Speed Automatic transmission for easy towing. This Four Wheel Drive easily gives plenty of power while providing near 24mpg on the highway! The upscale and bold design of the XLT is attractive with a spacious cabin, plus towing and cargo options for your active lifestyle! Cool fog lamps, a roof rack, and rear spoiler add to its design. Inside you will sit back and enjoy its modern, comfortable features. Check out the high-tech XLT instrument panel along with Ford SYNC, Sirius satellite radio and audio input jack that will keep you rocking out as you cruise around town. Our leather-wrapped steering wheel with a shift knob looks sharp while adding comfort. Your passengers will relax in the rear reclining seats and enjoy the excellent ride!